Korean napa cabbage & soybean paste soup is a healthy and delicious daily part of Korean cuisine. 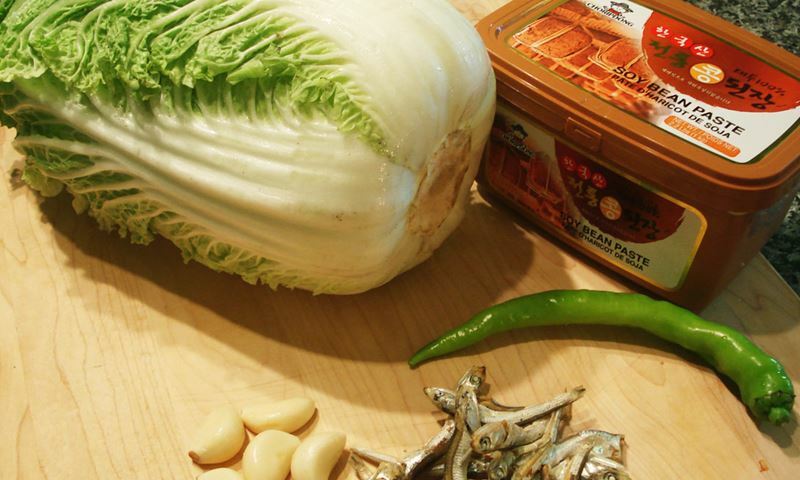 Napa cabbage is primarily used for making kimchi or Korean pickles, but is often used for soup, side dishes, or as an ingredient in a main dish. You can buy a small Napa cabbage (or bok choi) for just this soup. 1. Cut the napa cabbage into small pieces. Add all the ingredients in a large pot and cover with a lid. Bring to a boil. 2. OPTIONAL: If you like the napa cabbage very very soft, turn down heat and simmer 10 minutes. 3. Turn off the heat and serve! You can eat the dried anchovies. Korean people love to eat them and they are very good for you. There are still bones in the anchovies, and they are also edible. The anchovies with bones are a great source of calcium, too. However, if eating anchovies disturbs you, you can just pick them out. Do you like it spicy? Once the soup starts boiling, dissolve 1 tbsp hot pepper paste (gochujang) into the soup. Cooked Napa cabbage has a great texture. Additionally, the soybean paste with a little kick from the hot pepper gives this soup great flavor. Store this in the refrigerator or freezer and serve it with cooked rice and other side dishes.